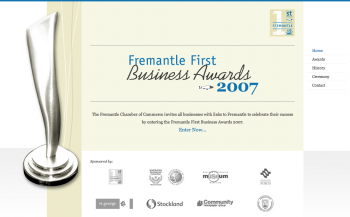 The Fremantle First Business Awards celebrates the successes of businesses operating in Fremantle, WA. The event organisers, wishing to reduce administrative costs, approached us to develop a site capable of managing award entries and ceremony registration. The resulting website allowed businesses to submit award entries by answering a set of questions defined by the event organisers, and businesses were able to save their submissions as a draft to complete at a later date. Award and ceremony registration payments were made through a secure credit card payment system.